's net profit for the second quarter ended Dec 31, 2018, rose to RM38.14mil from RM35.9mil recorded in the same period a year ago. Revenue increased 14.6% year-on-year to RM385.1mil from RM335.91mil previously, following the commissioning of new replacement lines at its Perak plant and full-quarter contribution from plants 10 and 11, the group said in a filing with Bursa Malaysia today. “The construction of our 12th plant has commenced and it will add to the group's production capacity when completed,” it said. Supermax, Malaysia's largest own brand manufacturer and the world's second largest producer of rubber gloves, also reported basic earnings per share of 5.82 sen versus 5.42 sen previously. 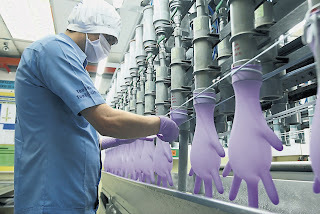 It said the global market for disposable gloves remained vibrant for both natural rubber and nitrile variants, driven by various factors including rising healthcare awareness and healthcare reforms mandating its use in the medical and other non-traditional sectors. “Global demand continues to grow at a rate of eight to 10% per annum and these positive factors continue to augur well for the company and the industry as a whole,” it said. On its contact lens business, Supermax said it would continue to work on obtaining the necessary product licences and approvals, expand its product range to include other types of lenses such as toric and colour lenses, and increase the market penetration for its products globally.